The weekly charter rates on the 28.74 metre (94’) motor yacht Quantum have been reduced by almost 15 per cent to €44,000 in July and August and €39,000 for the other months of 2016. Comfortable accommodation is for eight guests in four cabins consisting of two doubles with queen sized beds and two twins, all with entertainment systems and full en suite bathroom facilities. The saloon and dining area are open plan with large windows giving panoramic views and offer relaxation, fine dining and entertainment, and there is air conditioning and WiFi internet access throughout this yacht for charter. Deck areas are extensive and include a large sheltered aft deck with all the facilities for al fresco entertaining and dining while a huge flybridge comes complete with sunbathing spaces, sun pads, a wet bar and an outdoor dining area. Water toys include two tenders, wake boards, 12 sets of snorkelling gear and a range of towables including water skis. 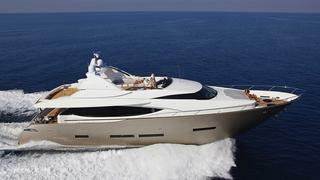 Quantum is available for charter through Ocean Independence.